It is just crazy what I do to loose weight, even went to donate blood today to loose a bit. No, just kidding of course. They actually called me yesterday at the blood donation center in Basel to ask if I could pass by, they needed my blood type (blood group). My blood is of type O negative which is not that common (See Wikipedia). This is of course not first time for me but to my shock I realized that I didn’t go since mid August. This got to change now. I’m not donating blood the easy way but in a way where they filter the blood and just take the red blood cells; the rest is pumped into me again. This takes a bit longer and they get more of what they can use. (I’m sure there is a fancy name for this procedure). Seems it is just called “Double red” if you check the Wikipedia for blood donation (See here). 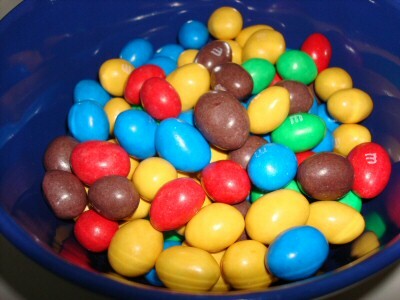 Sure, this is not good for the diet but damn those M&M’s tasted well. They ‘only’ got 360ml of the red blood cells but had to filter around 1060ml to get it. I have to wait another 6 month before I can go again (double time due to the double red system) and I will sure go again. Everybody who can go should really go if you ask me; sure people who are afraid of needles should not go. I always find it interesting when they insert the cannula into the vein and see how the blood runs out; call me a freak if you like. Another good thing about doing a blood donation is of course that they check the values for the ‘things’ in the blood and measure blood pressure. I’m happy to say all my values are good. In some cases they do find traces or get bad value; cause can be inflammation or in some cases cancer. This should NOT scare people away as any problems might be found earlier this way than if the person just waited. So if you are one of the persons who keep saying: I really should go. (Hello to my sister). Then how about calling the local blood donation right away and get started. It can never hurt but instead it might save peoples life. I’ve been meaning to give blood for a long time, maybe your reminder will help. Back when I was living in Australia I used to give blood every 5-6 months or so. It was a charitable act that got my time off work! But now I live in Japan, I can’t read Kanji so I can’t fill in the forms… Sigh. Still, kudos for you for doing such an act! Donating blood every once in a while is actually healthy. It paves the way for fresher blood to be made. Hi! Nice post. I’m O- as well. I worked in blood banking for many years. Thank you for being a donor! I’d love to donate blood but I’m such a wuss when it comes to the needle. Nice to see others out there can take it! I didn’t even want to get a blood test when I was in pretty bad shape health-wise! What a great post to encourage blood donations! i too love to make blood donations!